I’m back, and buried under a pile of emails. Time to unsubscribe. I’ve dealt with this before, sure. But I also have a Gmail label for posts I’ve planned to write on emails I’ve already gone through – and it has 30 emails in it (which probably works out to about 17 posts). For this blog, I really intended to read every email, every day, and write about a few every day. Of COURSE they piled up. That would have happened even if I hadn’t ignored my inbox for a week, because there’s really no way I’m going to ever write about 20-30 emails in a day, unless someone wants to pay me to do this as a full-time job (any takers?). I thought if I subscribed to everything I could find (and really, I’ve only scratched the surface there), I’d see new and exciting emails every day, and have a steady stream of content. And I do. But some brands don’t send emails that are new and exciting every day. 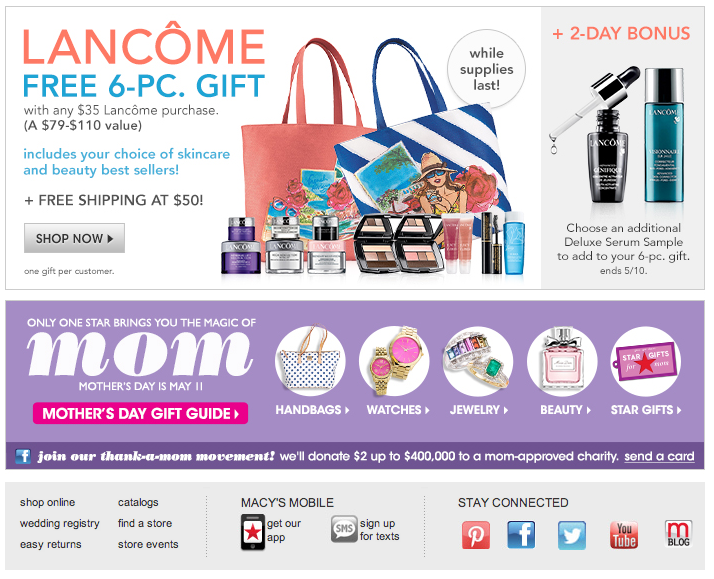 Some brands just make their print ad an image-mapped PDF and call it an email. (At least, that’s what it looks like). And some brands have a nice simple template that they use every day to plug in new content. Which is totally fine. I get it. It’s the exact opposite of what my brand does from a process standpoint, and I can definitely see why that would be beneficial for a brand to do. I teach a Gmail organization class at my company (because I’m super nutty about Gmail), and one of the first things I have everyone do is go through their inboxes, cut out all the clutter and unsubscribe from emails that they never read and don’t really need/want. Then I have them do a search for old emails of from that brand and delete them. It’s time to take my own advice. Here are some of the emails I’m breaking up with. I wish them the best, and this is not necessarily a reflection on how I feel about these brands in general. Mostly. 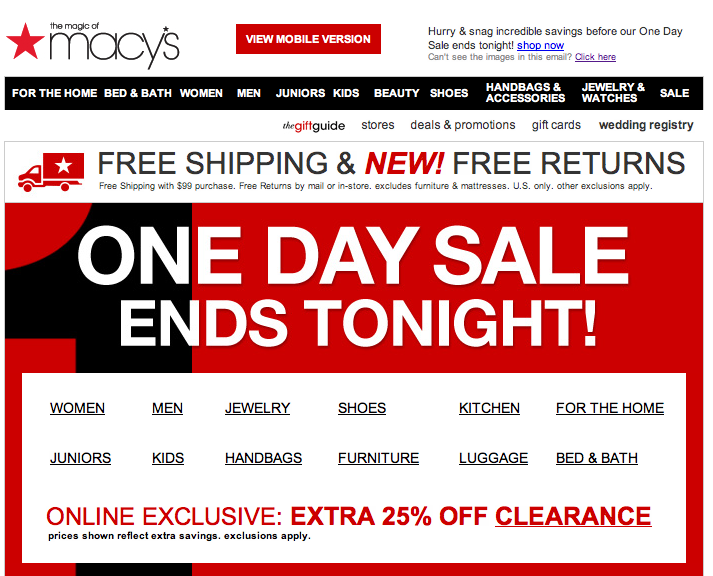 These emails feature a few products that happen to be on sale. The subject line is the same formula almost every day (but they did spice it up for Star Wars day), and the bottom of the email always has a “message clipped” note. For some of the deals, when you click on them, you can’t even see the “deal” price until you get to checkout. Best Buy? More like Best BYE. Click bait subject line? Check. Formulaic template? Check? Click bait article? Big time check. I actually enjoy this newsletter – when I have a chance to skim through it. I usually end up reading at least one of the articles in it, but it felt like something I could cut out for the sake of my inbox sanity, since I get this email daily and don’t usually have time to look at it. So I clicked unsubscribe, and it went to a nice opt-down page where I could pick a location (so I switched from “Everywhere” to “NYC”). THEN, it had the answer to all of my problems with these emails. At the bottom of this page, it had: “Change to Weekly.” DONE! 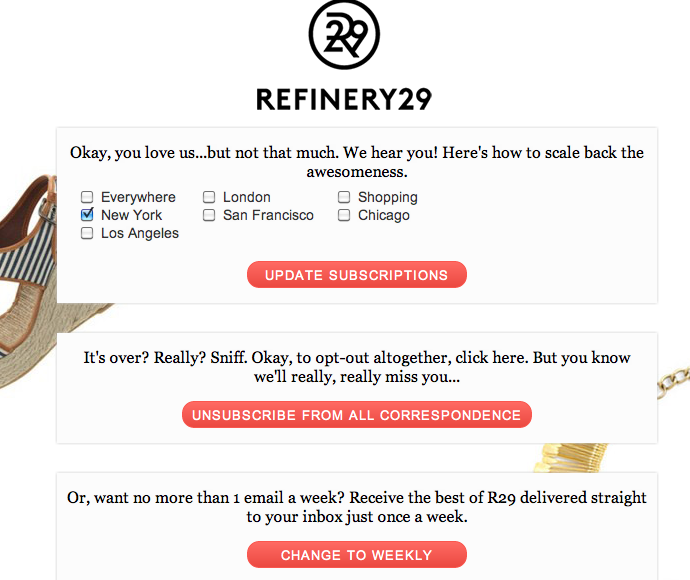 Well played, Refinery29! You kept me as a subscriber. 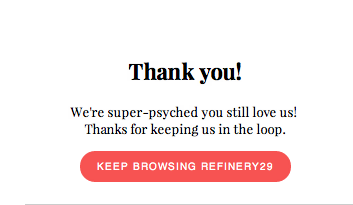 Refinery29? We’re fine. First off, I never subscribed to this. I honestly have NO idea how I started getting it. I looked around on the internet to try to find out if they had a parent company I may have subscribed to at some point, and they used to be owned by Barnes and Noble, but that was years ago. And the emails were somehow going into my Primary tab. 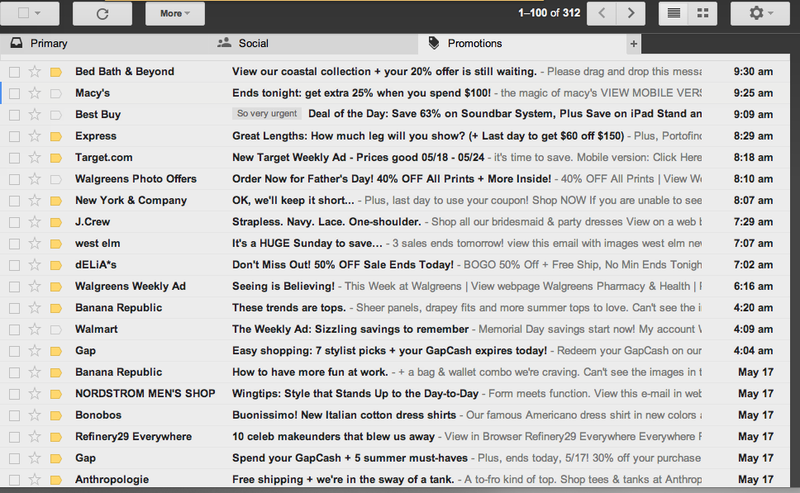 They mostly send weekly ads, monthly newsletters, and occasional one-offs in between. And honestly, they’re not even really trying. 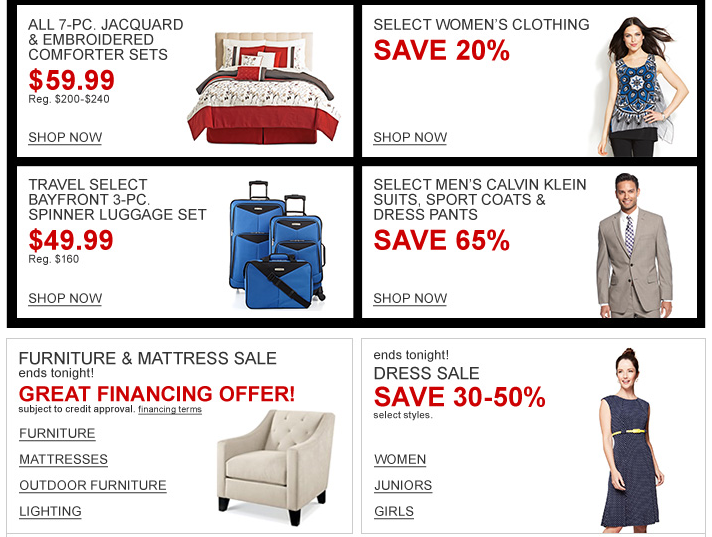 Their weekly ad email looks like this. I have no idea who can actually read any of it. 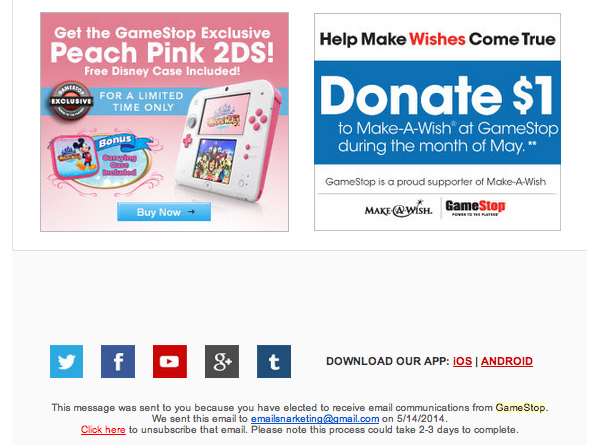 Their unsubscribe language says that I’m receiving the email because I opted to receive emails from GameStop (NUH UH!!!!!). I clicked on “Manage my preferences,” and it took me to a page to create an account. Their unsubscribe language says: “Click here to unsubscribe that email.” WHAT? Who even wrote that? 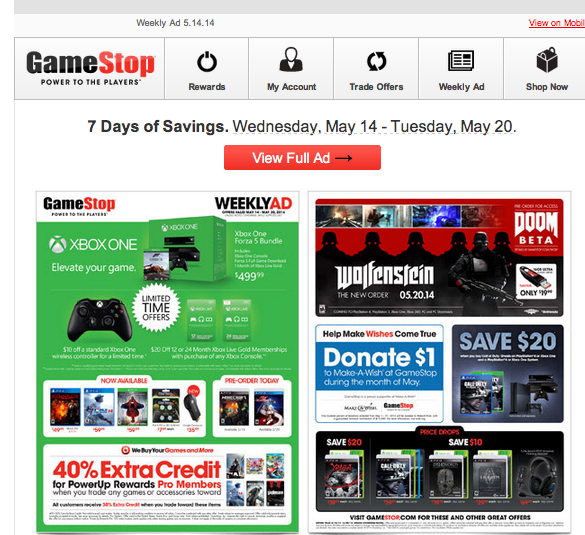 Time to STOP, GameStop. I’m going to keep going through emails and maybe even unsubscribe from more. Just clearing out these brands and all that they’ve sent ever/the last week brought my inbox down to 284.